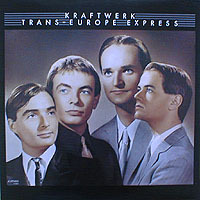 A t least one critic has described Kraftwerk’s music as possessing an “eerie warmth,” which would describe much of Trans-Europe Express. Safe from Radioactivity’s apocalyptic vision, Kraftwerk tackles the mundane, human world of the here and now: train rides, self-examination, self-loathing. The melodies are pronounced this time, almost conventional by Kraftwerk’s usual standards, some with a beat you can actually dance to. The vocals, delivered in affected speech and mechanized murmurs, are stationary posts along the way; the real landscape is depicted in synthesizers that aspire to modest flights of fancy. As influential an album as it was, Trans-Europe Express opened a Pandora’s Box of would-be musicians who couldn’t play instruments or sing either. Few aspired to the poignant man/machine imagery of Kraftwerk, and many ended up on the danceroom floor like soiled confetti. It’s important to separate TEE from the charlatans that followed. Kraftwerk was onto something big here, showing the mechanical routine of modern lives and blurring the line between human and automaton. “The Hall of Mirrors” and “Showroom Dummies” dig deep in the dirt of our own being; electronics here serve as sterilized instruments for self-probing. Even Ultravox, who faithfully replicated this album’s sound on “Mr. X,” only scraped the surface of Kraftwerk’s dark matter. The disconnection, the fleeting warmth don’t seek to reconcile the rational and the emotional; the message is that we’ve simply rationalized our emotions. The album’s centerpiece is “Trans-Europe Express,” a train ride through Europe that apparently stopped at David Bowie’s “Station to Station” for directions first. 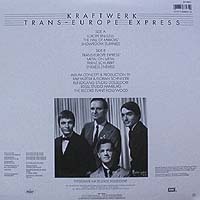 But where Bowie’s train eventually derails, Kraftwerk stays the course through “Metal On Metal” and dissolves into the ambient Eno-isms of “Franz Schubert.” The cycle (which may be viewed as a single, side-long opus) ends where the record began, echoing the opening “Europe Endless” on “Endless Endless.” Trans-Europe Express is such a controlled, contained experiment in electronic pop music that contemporary listeners might find the ride too uneventful for their tastes. The numbing sameness is by design, however, a calculated attempt to show the mechanized motions of our own lives. It may be hard to appreciate this in the wake of artists like Gary Numan and Ultravox who cloned Kraftwerk’s hard-won discoveries into ubiquitous product, but Trans-Europe Express proved that an engine stoked only with electronics could scale the hill of popular appreciation.